ARLINGTON, Texas (AP) — Former Texas defensive end Cory Redding would have loved to have another shot at Oklahoma in his college career, especially in 2001 when the only loss for the Longhorns before the Big 12 championship game was to their Red River rival. But back then, the Big 12 still had 12 teams and two divisions. There was never the chance for a rematch. On Saturday, for the first time in 115 years, the fifth-ranked Sooners (11-1) and ninth-ranked Longhorns (9-3) will face each other for the second time in the same season. 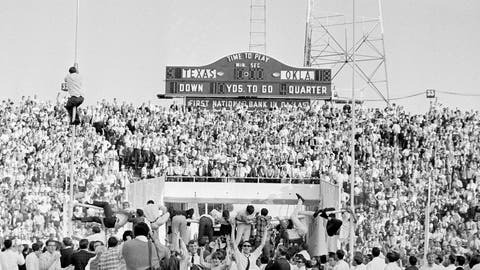 Texas won 48-45 eight weeks ago at the State Fair of Texas, where every game between the two teams has been played since 1929. Instead of Cotton Bowl Stadium, where passionate fans clad in crimson or burnt orange are split 50-50 for the regular-season games always played on the first or second Saturday in October, the Big 12 championship game will be decided about 20 miles away at the home of the NFL’s Dallas Cowboys. Or maybe having a championship on the line (and for the three-time defending Big 12 champion Sooners the chance to avenge their only loss and maybe get into the College Football Playoff again) will only add to the bitter rivalry first played in 1900. “Deep pride. It’s just a lot of that tradition, the Sooners don’t like Texas and the Longhorns don’t like Oklahoma,” said Redding, who was part of a win over the Sooners as a freshman in 1999 that was followed by three consecutive losses in the series before his 13-season NFL career. Baker Mayfield, the No. 1 overall pick by the NFL’s Cleveland Browns after winning the Heisman Trophy last season as the Sooners quarterback, won his last two meetings against Texas. Colt McCoy, the Longhorns’ quarterback for their last Big 12 title in 2009, used the terms “unbelievable” and “amazing” when talking about the rematch. He said as a player he would “just be completely stoked” to be part of such a rematch. Their first title matchup between the two comes in the 114th game of the series. The game has been played in Dallas, almost exactly halfway between the Austin and Norman campuses, since 1912. Playing outside of October and away from the Cotton Bowl will be different. “I was still, I think, like 60 years from being born probably the last time it happened,” said Riley, at 35 still one of the youngest FBS coaches. Texas is the only team to hold an all-time series lead against the Sooners (62-46-5). They have split the last six games, and the last five have been decided by a combined 25 points. Redding did play two Big 12 title game rematches while he was at Texas, against Nebraska in 1999 and Colorado in 2001. The Longhorns won the regular-season game and lost the rematch both times. The 2001 Big 12 title game loss to Colorado, a team they beat 41-7 only six weeks earlier, cost the Longhorns a shot at the national title.